In Type O Negative's song "Black No. 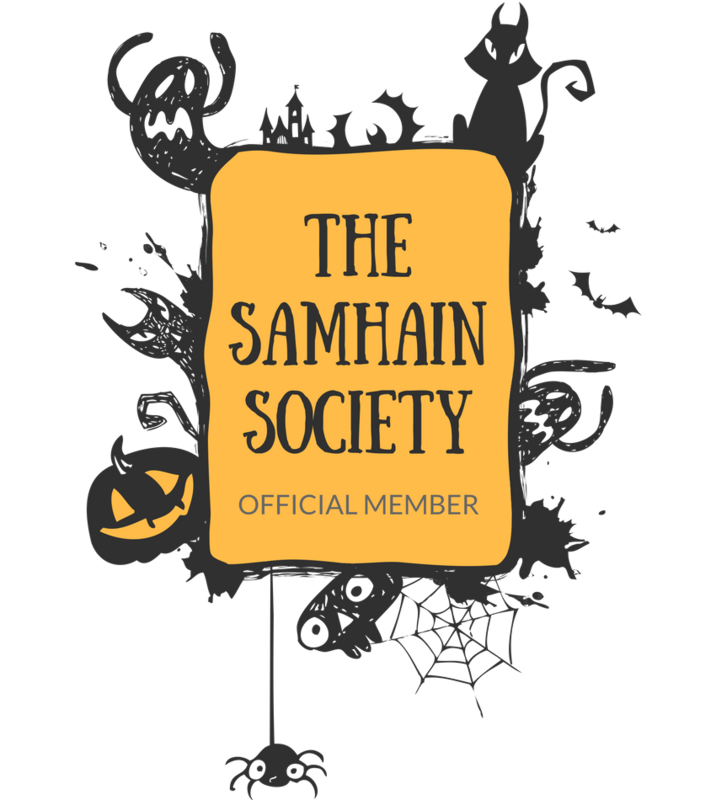 1," Peter Steele sings "Her perfume smells like burning leaves," and I've been forever searching for a scent like that which evokes the spirit of Samhain! What do you picture the autumn season smelling like? For me it's a woodsy, smoky scent of autumn leaves with a bit of candy corn sweetness, apple orchard tartness, pumpkin patch earthiness, and a sprinkle of brimstone. Who knows if a scent like that actually exists, but I'm on a quest to find it! In my search this year I've come across a few small, independent companies who are making perfumes, bath bombs, lotions, and other potions in lovely autumn and Halloween scents that I'm absolutely drooling over! I've compiled some of these for you below, all of which are vegan and cruelty-free (note: always double-check ingredients since formulations can change, though most of the businesses listed below are themselves vegan and cruelty-free!). Hopefully this year I can find some scented treats that will keep me smelling like Halloween long after all the jack-o-lanterns have been blown out on October 31st. Black Phoenix Alchemy Lab - BPAL is perhaps the most established and most-sought after purveyor of extraordinary perfume oils! One of their most-popular scents is called Jack ("The scent of warm, glowing jack o'lanterns on a warm autumn night: true Halloween pumpkin, spiced with nutmeg, glowing peach and murky clove. "), which is lovely! 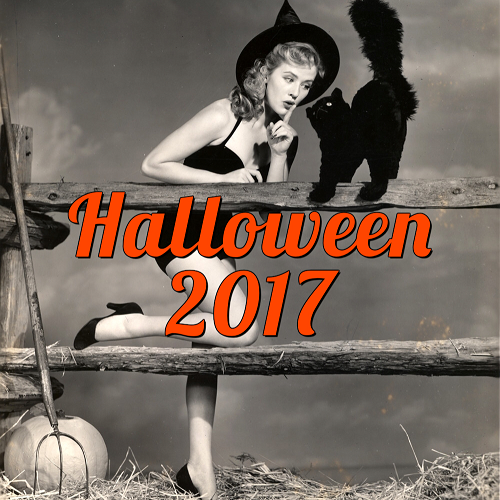 Their new 2016 Halloween collection also offers some tempting scents, including their Dead Leaves line I'm intrigued by, as well as Samhain 2016 ("Truly the scent of autumn itself - damp woods, fir needle, and black patchouli with the gentlest touches of warm pumpkin, clove, nutmeg, allspice, sweet red apple and mullein."). The only problem with BPAL is that I want to buy them all! 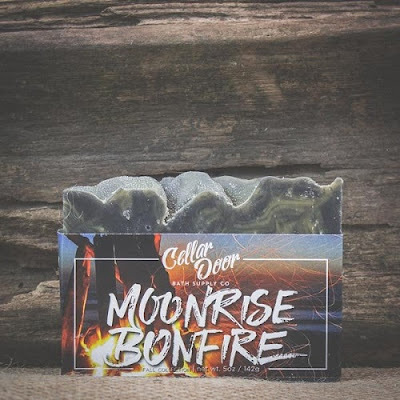 MoonCraft Emporium - This bathworks shop has lots of fall-inspired products, but I have my eye on the Mabon Apple Spice Bath Bomb - "This Limited Edition, mondo-sized bath bomb is a scrumptious spiced apple scent with just the faintest notes of sandalwood. 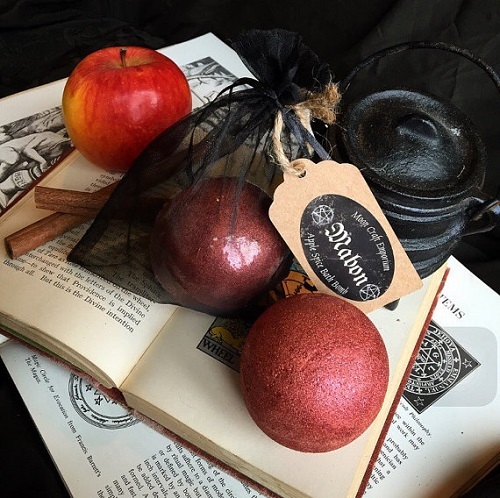 Red in color and coated in shimmer, this bath bomb weighs over 7oz and has a diameter of roughly 3 inches." 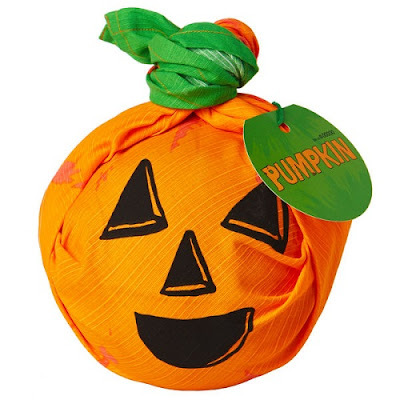 They also have some adorable pumpkin spice bath bombs and other beautiful products. Witch Baby Soap - With solid perfumes in scents like Hallowmas, Queen of the Damned, Graveyard, Witch's Woods, plus bath bombs (Dead by Dawn! ), body scrubs (Children of the Corn! ), body butters (Candy Apple Body Butter! ), soaps, salves, and facial care (Pumpkin Head face mask! ), this shop has you covered head to toe in autumnal scents. I have my eye on the Hallowmas bath bomb (shown above), which has "...the intoxicating aroma of crushed caramelized jack-o-lantern guts drenched in bourbon vanilla with a dash of warm pumpkin spice." Cellar Door Bath Supply Co. - I love their entire Halloween collection, but I've been lathering up with the Moonrise Bonfire soap, which is described as "woodsmoke. scotch pine. white hot embers. the soul-soothing scent of summer’s last bonfire hanging in the cool air on the moonlit shores of Lake Michigan." I am also very fond of Pumpkin Guts and Lavender Pumpkin (most of their scents are also available as soy candles!). The Quixotic Eye - This shop has a Candy Corn perfume that sounds divine! 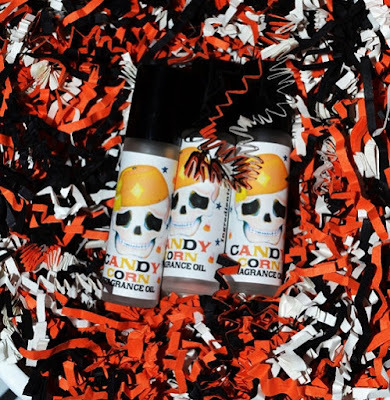 "Candy Corn is the true to name sugary rich vanilla and warm buttery cream scent of our Halloween Fragrance Oil Collection. A deadly sweet Halloween staple, no true Halloween lovers fragrance collection is complete without it!" Other Halloween fragrances the shop offers are Pumpkin Party, Wicked Witch, and Scaredy Cat, all of which can also be ordered as lip balms, candles, room sprays, etc.! Ghoulish Delights Bath Shop - This shop is releasing a limited edition Halloween 2016 collection based on your favorite Halloween movies like Hocus Pocus, The Nightmare Before Christmas, Trick 'r Treat, and The Halloween Tree tonight, October 7th, 2016 at 9PM EST! There will be body butters (shown above), body washes, bubble bars, and who knows what other delightful surprises. These yummy creations sell out fast, so get yours soon. They also carry horror movie-inspired body scrubs, body washes, skin elixirs, and more! The Trick 'r Treat-themed products are called Help Me With the Eyes and are a "warm blend of pumpkin flesh, rum, sugary vanilla and cream. The sweetness is balanced by the spicy ginger and nutmeg." Trader Joe's Pumpkin Body Butter (review) is an inexpensive (it only costs $4.99) way to smell like autumn! I love its sweet yet tart mix, which reminds me of apple cider mixed with a hint of warming pumpkin spice. I love the thick, luxurious body butter and stock up on it every year so I have autumn-scented lotion year-round! If you don't have a Trader Joe's nearby, you can get some on Amazon (though at a very steep mark-up). Lush Cosmetics - I always love their Halloween selection and this year they have lots of adorable, yummy-smelling soaps, bath bombs, bath melts, and more! I love the Lord of Misrule shower cream, which is an intoxicating perfume of black pepper, patchouli and vanilla. 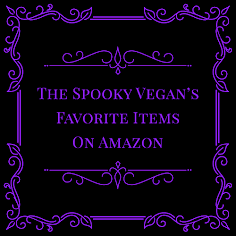 All their Halloween items this year are vegan, too! What does Halloween smell like to you? 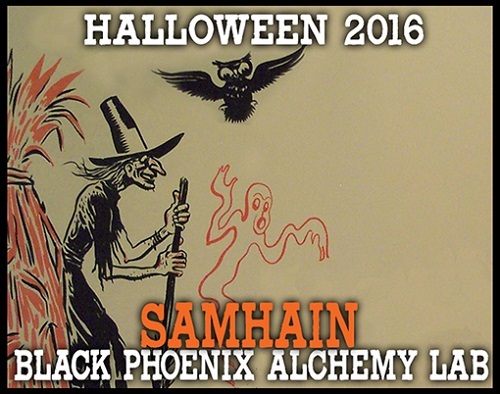 What are your favorite Halloween potions to keep you smelling like Samhain throughout the season (and beyond)? For the past four years I've ordered the Caramel Apple body Butter from Enchanticals Perfume every October. 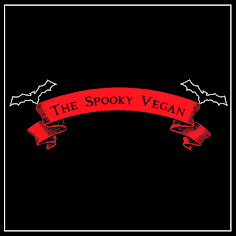 They're a vegan company based in California and have a ton of great Halloween scents! Check out Alkemia perfume on etsy, they have the best Halloween/fall perfume oils! I own Halloween 2016, Pumpkin Stumpet, Black magic women, County fair, Smoke & mirrors, & an apple cider scent I forgot the name. I did try a sample of one that smelled like burnt leaves!